For those Spurs supporters of a certain age, the FA Cup is in our DNA and Saturday�s shoddy surrender to an ordinary Leicester City team cut as deep as a dentist giving us root canal treatment. I just wonder how many of the players � and head honcho Pochettino � realise just what the world�s oldest cup competition means to those with Lilywhite blood? It is not just another tournament. It is a proud part of our tradition how we have lifted the treasured trophy eight times, and we can reel off the captains who have collected it since way back in the Southern League days � Jack Jones (1901), Arthur Grimsdell (1921), Danny Blanchflower (1961/62), Dave Mackay (1967), Steve Perryman (1981/82), Gary Mabbutt (1991). It is part of the folklore that we pass on to our kids (and grandkids) like a relay baton of pride. Now we have to get the prayer mats out for the far less meaningful League Cup (ok, Capital One Cup) to save our season from disintegrating in front of our eyes. Elimination in the second leg of the semi-final at Bramall Lane on Wednesday will be measured on the Richter Scale and will drop a cloud of uncertainty on Pochettino�s reign. Spurs historians will be quick to tell you that we beat Sheffield United in a replay to win the FA Cup final back in 1901 to become the first (and only) Southern League club to capture the trophy back in the day when it was the be-all-and-end-all of competitions. Victory will put a bounce in our step on our way to Wembley. We will now discover exactly what Pochettino considers his best side. He took squad rotation to dizzy lengths on Saturday when making nine changes for the Cup-tie with Leicester. Call me old fashioned, but I cannot see how all that chopping and changing can help continuity, confidence and cohesion. With my usual one-foot-in-the-past (the other one�s in the grave), let me point out that Bill Nicholson called on just 17 players in the historic 1960-61 season, with three players (John Hollowbread, Ken Barton, John Smith) getting only one game each, all in the Cup. Already this season, the Poch has selected 28 players but fighting on four fronts compared to the two competitions back in the 60s. The one thing we all know after the final depressing ten minutes on Saturday is that Hugo Lloris is vital for any hopes Spurs have of winning silverware this season. Michel Vorm had made some impressive Lloris-style saves early on, but I am convinced Hugo would have stopped the two late Leicester goals that ended our FA Cup dreams. Some called the defeat �a blessing in disguise� because it eased the fixture congestion. They were not looking through my Lilywhite-coloured glasses. I saw it as a kick in the history box. FOR those of you who love to be in the company of Tottenham legends, a heads-up that there are still a handful of tickets left for the Jimmy Greaves 75th birthday bash at Stevenage on February 20. Helping Greavsie celebrate his glorious, rollercoaster life will be captain supreme Steve Perryman and Jimmy�s old shooting partner Alan Gilzean. Those who remember the feats of the G-Men will immediately be moist eyed. Also joining in will be the man who is a bruise on Jimmy�s memory, the old Chelsea warhorse Ron �Chopper� Harris, one of the hardest men ever to play the game. Today, he would be locked up in the Tower. For those who have not seen/heard Jimmy�s standup, let me tell you his delivery and punchlines match any professional comedian. We have collaborated on 20 books together, and he is still coming up with new chapters. We have known each other since we were seventeen, Jimmy dishing up goals galore as an apprentice with Chelsea while I was serving my apprenticeship in delivering alliterative analysis (still much to learn). Have a look at this photo and judge which of us has worn the best! 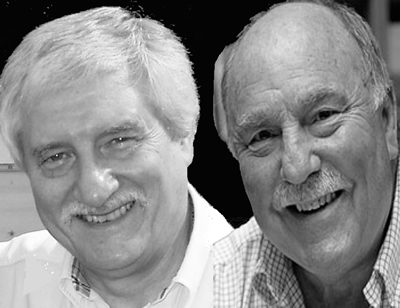 You can get ticket details for the big Greavsie night out here: http://www.a1sportingmemorabilia.co.uk/vip-ticket-an-evening-with-jimmy-greaves-75th-birthday-dinner-1.html or contact his omniscient manager Terry Baker at www.a1sportingspeakers.com. Greavsie scores again! You are very welcome Eric, and you join supporters taking part from all points, including the United States, Canada, Australia, Argentina, New Zealand, Hong Kong, South Africa, Indonesia, Malta, Cyprus, Saudi Arabia, Spain, Slovakia and right across Europe. Most of you were correct with the answers to last week�s questions: Who scored two goals in the FA Cup quarter-final replay against Sunderland at White Hart Lane in 1961, and � for a bonus point � what number shirt did he wear in the Final at Wembley? Yes, it was tiny Terry Dyson, who had a heart as big as his head. He is still a popular visitor to the Lane where he has legend status. Terry, now 80 years young is steeped in sport. His father was the famous pre-war Yorkshire jockey �Ginger� Dyson, and his nephew Simon Dyson is a leading player on the European golf circuit. We will never forget Terry�s two thunderbolt goals that helped Spurs lift the European Cup Winners� Cup against Atletico Madrid in Rotterdam in 1963. First name drawn from the senders of the correct answers is Kevin Hill, from Tottenham territory at Hoddesdon, Herts. He has been a fan since the Glory-Glory days of the 1960s. I will be emailing him a screen version of my Bill Nicholson Revisited book. Kevin is one of more than 100 contestants sharing top place in the League. I have some tie-breaker ideas up my sleeve that will break the log jam in the weeks ahead. Meantime, please keep joining in because I like your company. I always try to send a personal reply. It is not too late to join in the fun. I will find a way of working out averages so that Spurs fans can join in despite missing the start, but obviously those who take part every week have the best chance of winning what will be a suitable prize. Remember the old adage, it�s not the winning that matters so much as the taking part. This week�s challenge is triggered by Wednesday�s League Cup semi-final showdown with the Blades. For three points, Who scored two goals for Spurs against Sheffield United in a 5-0 First Division victory at White Hart Lane on March 27 1976, and for a bonus point, which team did he join from Tottenham in 1986? Email your answers please to SOQL4@normangillerbooks.com Give your name, the district where you live and how long you�ve supported Spurs. I will respond.